I consider myself a sophisticated fellow - an elegant gentleman, if you will. Therefore, I am extremely excited, and perhaps giddy, to be taking my two daughters, ages 4 and 2, to tackle the oldest running steel roller coaster in North America tomorrow. We will be going to the Memphis Kiddie Park in Brooklyn, Ohio, and we plan on defeating the Little Dipper. I hear this all-steel roller coaster has been around since 1952, and it's the oldest in North America. It's also for kids. Joy! We will put a metaphorical spear through the heart of the Dipper, then take out the Dipper's heart, chew it and kick it through a goal post. Of course, that assumes a goal post is nearby. 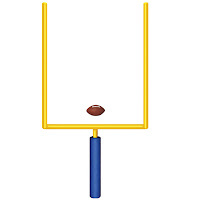 If no goal post is nearby, we will simply play hacky sack with the Little Dipper's metaphorical heart. 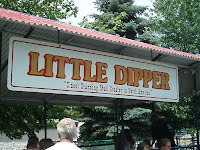 However, if the girls deem the Dipper too antiquated and/or scary for defeat, we will move onto the next ride. I'll be cool with that, but that does not mean my intention is not to put a spear through the Dipper's heart, take out the heart, chew it and then kick it through a goal post. We did put a spear through the metaphorical heart of the Dipper. Actually, Sophie did, while Chloe abstained from the Dipper and ferris wheel. ... Fun, fun continues. Got to run.